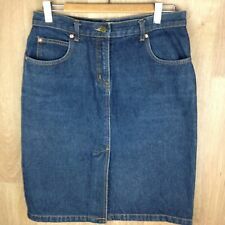 Fabulous 70s/80s Denim A-Line skirt with pockets. What's not to love?. Best fit size 8-10. VERY NICE SKIRT. WAIST - 80 CMS. Denim Skirt from Asos. New with tags. Size is petite 4 however would fit sizes 4 & 6. Veronika Maine Size 8 Skirt. Condition is Pre-Owned. Sent with Australia Post Pre-Paid Parcel Post Satchel 500g. Model: T8W2400026. Colour: 443 CHOCOLATE. THOMAS COOK. SKIRT EDGE WIDTH: 52CM (Half Edge). ZIP DETAIL SKIRT. SKIRT LENGTH: 49CM. SKIRT WAIST:38CM (Half Waist). SKIRT HIP: 48CM (Half Hip). Hem circumference 76cm. 99% Cotton, 1% Elastane. Back length 42cm. Side Length 40.5cm. If on the rare chance I may happen to miss anything which may be wrong with the item, this is an oversight only and not intentional. Back pocket width & length 13cm, Front pocket width 10.5cm, Zipper length 8.5cm, Front. This used to be a dress but has been sewn into a cute skirt. Elastic waist at back, front is streamlined flat fabric that fits against the stomach. Pretty rose floral pattern. Fully lined with a white cotton underlay. A favourite of mine! STUNNING STYLE. CHEAP BUY IT NOW BE QUICK! Denim skirt with front zip & hip pockets. Classic blue stretch short. would suit size 8. length 36cm. for a fraction of the price. A quality item. slightest washfade. gently worn. Forever new black/gold jacquard skirt. FOREVER NEW . Length~42 cm. Acc Not Inc.
VERONIKA MAINE skirt. In excellent condition. Ladies red check Punkabilly mini skirt with lace detailing overskirt. Lee Cooper Straight Slim Denim Skirt Pockets Ladies Sz XS 6-8 EXCELLENT!! The fine Italian fabric is a light grey 60% cotton, 21% rayon, 16% acrylic & 3% other fibres mix and has a firm, linen like feel. There are several very good quality, designer clothes to suit petites to be listed over the next 2 weeks. Waist:62cm Length: 38cm Hip:72cm. Cleaning: machine. Fabric: Cotton Elastane. MNG Black Mini Skirt. Size: EU 34, AU 6. 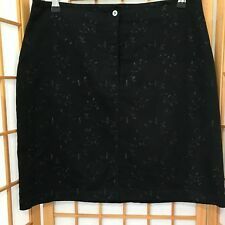 TOPSHOP MOTO womens petite denim skirt size 10 floral roses embroidered #394. Condition is Pre-Owned. Sent with Australia Post Pre-Paid Parcel Post Satchel 500g. Cute mini skirt, size 10, in excellent condition. Fully lined, fitted at waist with side zip. Basque Skirt. Condition is Pre-Owned. Sent with Australia Post Pre-Paid Parcel Post Satchel 500g. Suit size 6, 8, 10, 12 as lace up front is adjustable to suit. african fabric. Flattering good used condition. Massive wardrobe clean out. Features: Light tan with coloured embroidered floral design, pencil skirt with flared hemline, side zip, fully lined. Colour is very subjective and depends on your computer or device screen/monitor. Ladies grey denim skirt, size 6, Sportsgirl. Condition is Pre-Owned- worn once and washed. Sent with Australia Post Pre-Paid Parcel Post Satchel 500g. New listingRVCA Jolt high rise fitted denim skirt. Size 24 - (XS, 6). RRP$69. Brand new! RVCA Jolt high rise denim skirt! Size 24, 6, XS. Not stretchy denim really, it's quite structured. Perfect colour and wash. Features a few patches of distressed detailing at various places on the skirt. Quality skirt in as new condition. Women's Cotton On, light wash tencil denim skirt (Size XS). It ties to one side and is a-line in shape. Pickup free in the Ballarat area. Waist to hem:74cms. FLORAL MINI SKIRT WITH A BACK ZIP.